Do you ever wonder what the Graphcom team does outside of work? We have so many creative minds in our midst, and many of them carry their skills over to hobbies like crafting, designing, and volunteering. Check out how some of our team members keep the creative juices flowing outside of their 9 to 5. Harrisburg resident Allison opened an Etsy jewelry shop in 2010 and began selling her handmade earrings. After receiving many compliments on a pair she was gifted, she mimicked their style in her own jewelry and it caught on. However, only making earrings became tedious after a while, so she branched off into working with gemstones and making other jewelry, too. During the early days of her Etsy shop, she lived in Kentucky and found inspiration at a shop called Dandelion Bead Connection. When she moved to Colorado, she loved the endless bead options and inspiration there. 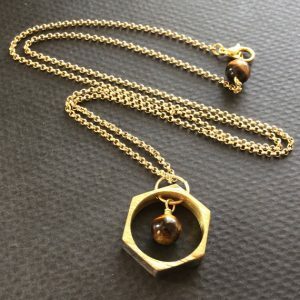 Eventually, she started making pendant necklaces and using materials such as reclaimed wood and repurposed brass pipes to make trendy “upcycled” pieces. Currently, Allison has loose stones that she wants to make into necklaces and “do something different” with. Her next move is to experiment with different materials and work more with sterling silver. She says she eventually would love to take a stone-setting class to broaden her talents. 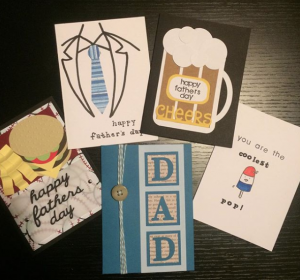 She primarily makes cards for her family and friends, and even keeps a stash in her office at Graphcom, in case a colleague forgets to get their loved one a birthday card. Chelsea’s mother is an avid scrapbooker, so this made it easy for Chelsea to find and use materials and tools for her cards. “I use all kinds of stuff,” she says, mentioning that she’s used cardstock, vellum, wire, lace, ribbon, and more to create unique cards. She even created birthday cards with fancy straws as candles. Chelsea says her favorite cards to make are the more complex ones, especially “any occasion” cards, because they’re fun and she likes to see people’s reactions when they receive them. For Beverly, what started as crocheted projects for friends and family soon turned into a labor of love for those in need. Today, Beverly crochets lap blankets and prayer shawls for folks in hospice care, and chemo caps for hospitals. It’s a year-round hobby, she says. Beverly spent over 20 years volunteering with the American Red Cross Disaster Response and was a member of the Upper Adams Lion Club, which put her into contact with other organizations that help the community. A fellow Lion’s member told her of the need for prayer shawls, so she immediately put her skills to good use. Beverly recites a prayer as the shawl is made, to stitch the prayer into the shawl to comfort the person who receives it. Beverly feels that the most rewarding part of what she does is giving something to someone even though they may never know who she is. She wants recipients to know they’re thought of every day. When art is life, it’s hard to turn the creative switch off. Just ask Ellen. Even when she’s not designing marketing materials for our clients, she spends her downtime freelancing and designing wall art, save-the-dates, wedding invitations, and more. She began freelancing once she graduated college to make extra cash. She also did side work before graduating, but she felt bad charging for it when she was still learning. Now, she says it’s a great low-key hobby that earns her some extra cash. One of her projects includes buying burlap sheets, printing words or phrases on them, and framing them. She began giving these as gifts, but eventually the recipients wanted to order more from her. 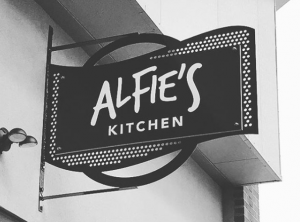 Ellen also designs logos, most recently for a new restaurant in Pennsylvania called Alfie’s. The main way she gets freelancing requests is by word of mouth, but she also has an Instagram (@ellenwetzeldesign) where she posts pictures of her work. He volunteered his time to strip the paint, make repairs, prime, paint, and coat to keep the pieces safe from winter weather. It took the entire summer to make complete restorations. Karydwen told her kindergarten teacher that she wanted to be “an artist, dinosaur hunter, or a scientist.” While her career at Graphcom as a variable data tech is a little different from those aspirations, she still is an artist on the side; she creates and sells handmade jewelry. Karydwen has had her Etsy shop for almost five years, and she says that her love of stones, glittery shiny things, and the joy of creating art inspire her jewelry-making. She makes jewelry “sporadically,” as she feels inspired. 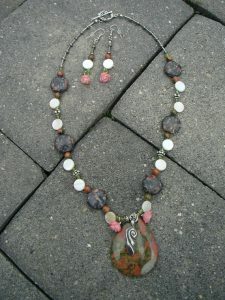 Her favorite materials to use are raw, semi-precious stones. 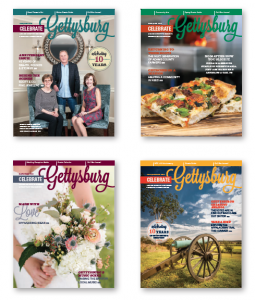 More than 10 years ago, Troy and Jess started Celebrate Gettysburg magazine with nothing more than big dreams and hard work. They never imagined that their small publication, which served as an outlet to showcase all that is interesting, unique, and good in Adams County, Pa., would become one of the region’s most sought-after publications. Today, the magazine has a readership of more than 45,000 with over 200 distribution locations and readers all over the country. Jess serves as art director, overseeing all aspects of the magazine’s design as well as general operations. Krista is the editor of the magazine, assigning, editing, and writing stories, and working one-on-one with freelance writers and photographers. Jenna, Ellen, and Chelsea design each issue, and Kylee sells ads. Want to get to know our team even better? Let’s be friends! Call 800-669-1664 or email info@graphcom.com.